The Wisconsin Humane Society offers a number of programs designed to increase empathy toward animals. These programs impact children, animals, and the community in positive ways. Together with our partners, we are enriching lives one relationship at a time! Follow the links below to find out more about these programs. Using reward-based training methods, students work in pairs over a two-week period to train a shelter dog to follow basic cues. By working closely and bonding with shelter animals, PAL participants expand their circles of compassion to include animals. PAL seeks to increase self-esteem and pro-social skills like empathy and conflict resolution, which research shows decreases a child’s likelihood of becoming involved in violence. 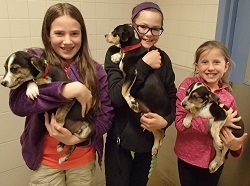 The Wisconsin Humane Society is honored to partner with COA Youth and Family Services Goldin Center and Big Brothers Big Sisters of Greater Milwaukee to provide programming for the young people they serve.